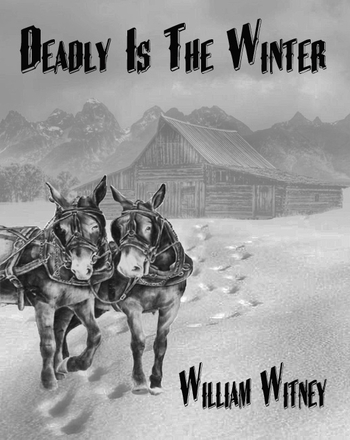 Click this link for William Witney's authors page on Amazon. Set in the American West of the early 1900s, this is a heartwarming story of a young boy and an ornery mule learning to work together as a team, when circumstances threaten the family farm, upon which their livelihood depends. An action-packed adventure from cover to cover, ‘Yaqui’ reads just like a screenplay that is reminiscent of film director William Witney’s cliffhanger serials, which delighted audiences, week after week, at movie theaters in the 30s and 40s. This historical fiction, loosely based on actual people and events, is set in the late 1800s, at a time when Mexicans and Yaqui Indians were fighting to the death over the rights to the lush farmland of the Yaqui River Valley. The hero of the story is Cajeme – “he who can go without water” – a proud, God-fearing Yaqui Indian, who for the past 15 years has served as a trustworthy and respected scout in the Mexican Army. 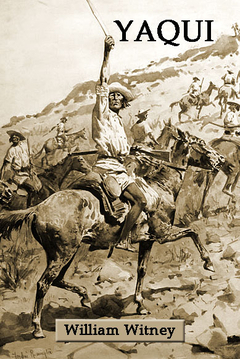 Although considered a traitor by his own people, he persuades the Mexican authorities to appoint him Chief of the Yaquis as a way of achieving peace but then, when the government breaks faith, he uses everything he has learned about this Mexican oppressor to his advantage and seizes the opportunity to win back the trust of his people and fight for the independence and very survival of the Yaqui Nation. The unique landscape of the Mexican State of Sonora, with its sleepy towns, busy seaport cities, arid deserts and majestic mountains provides the backdrop for a kaleidoscope of thrilling action sequences. Feelings of love, hate, betrayal and revenge are all brought to the fore over the course of a series of battles, which highlight Cajeme’s cunning and daring – battles fought on land, at sea and on horseback with knife, bayonet, rifle, lance, dynamite and cannon - until both sides are brought to their knees and the bargaining table by a force over which neither has any control, but which ultimately leads to salvation for both Cajeme and the Yaqui people. A serial TV and motion picture director and great story teller, William Witney shares some of his memories and adventures from his experience in the early days of motion pictures from 1933 to 1945. Unfortunately, as some speculate, the stress of putting this book together may have led to his stroke in December of 1995. We will never know. Since he never had the opportunity to complete the sequel, we are very thankful that we have this book to enjoy and cherish. Pictured to the left is a glossy book cover Witney had printed for the hardcover versions of his book. (Hard cover books are no longer in print). We currently have a limited number of these glossy book covers and will be offering them for $5.00 plus shipping and handling. (while supplies last) This book cover will fit the paperback versions. - Our Store - If you would like one of the glossy book covers, while supplies last (it will be autographed by Bill's son, Jay Dee Witney, if requested) . Any proceeds from the book covers helps keep the William Witney web site alive. 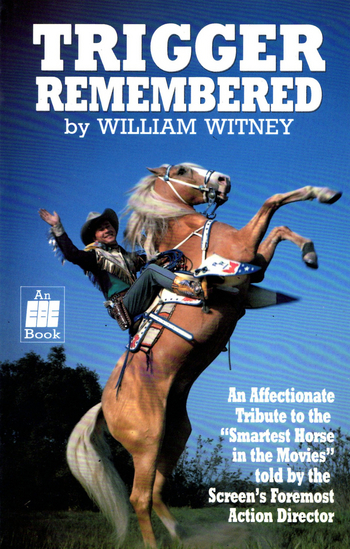 "Trigger Remembered is the fascinating story of the screen's greatest horse, told with love and affection by William Witney, director of 27 Roy Rogers westerns." This book represents Witney's love and affection for the animals he worked with on set and the animals he had at home. The love and respect reciprocated by these great animals went far beyond the screen of the Saturday matinee. Because this book is not currently in print, it has become a collector's item. Occasionally, copies can be found on other sites, like Amazon. 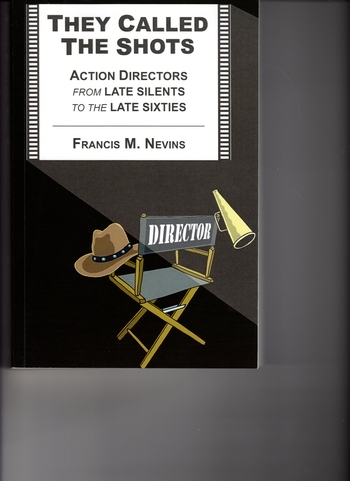 William Witney aficionado Francis M Nevins new book ‘THEY CALLED THE SHOTS’ is a treasure of stories and information about many of the motion pictures directors of the golden age of Hollywood. Any fan of Hollywood’s yesteryear is sure to treasure this addition to their library. Mike is a long time family friend of the Witney’s and congratulate him for this treasured publication of history and thank him for making William Witney your #1 and greatest. Click this Amazon link to purchase.